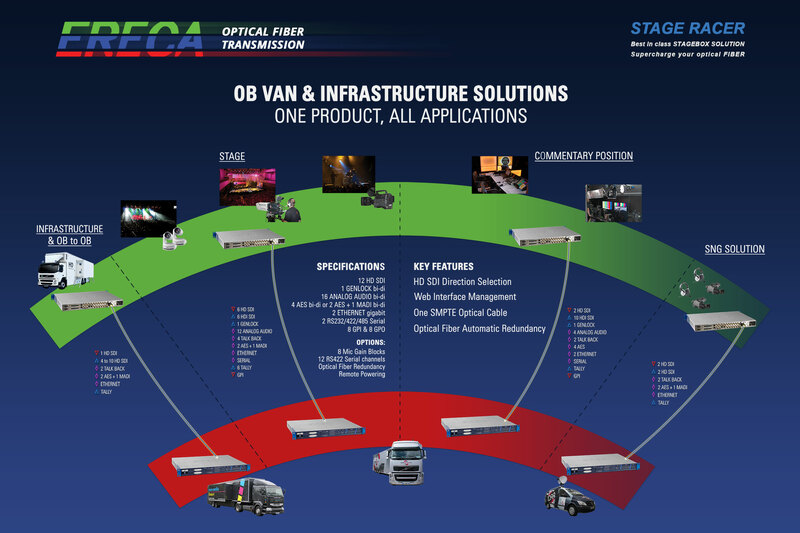 The STAGE RACER product line is an ultra flexible solution to connect a stage to an OB VAN. 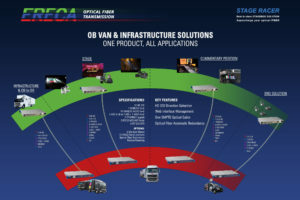 With the ERECA unique feature for on the fly direction configurable HDSDI channels and the numerous commodities signal transmitted along the videos, the stage racer is the product of choice for an affordable fast and easy event deployment. 1 bidirectional MADI (AES10) Signal (Shared with 2 of the 4 AES connectors). For flexible setup the mechanical is declined in a 1U rack which fits everywhere and in a very rugged compact die cast aluminum box. This latter enclosure ensures excellent shock/drop protection along with dust and water resistant capacity for all “no fly case” applications. 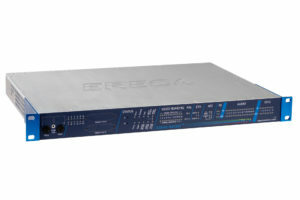 Links can be built between racks, rugged boxes or rack and rugged box. All the signals are transmitted on 2 singlemode fibers. 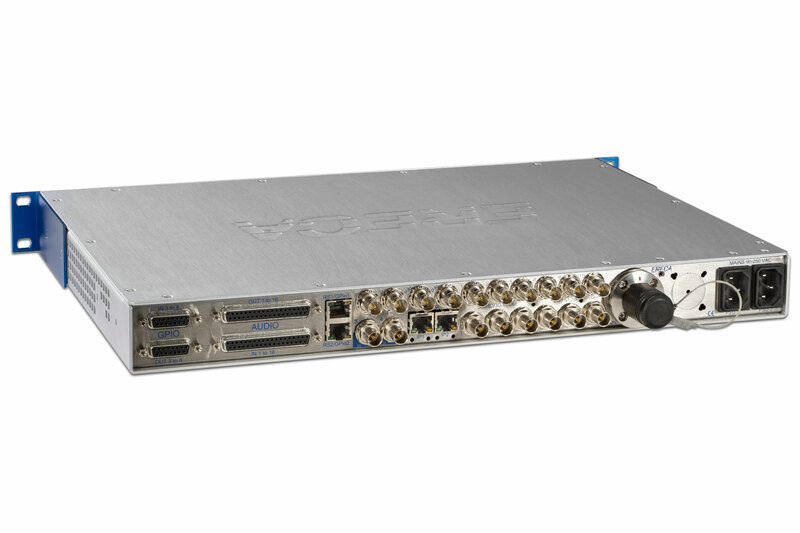 As an option, an optical cable failover is built inside the modules by adding a second connector. In case of fiber break the equipment automatically select the other cable. STORA RX can be remote powered through Hybrid cable. Standard connectors are used for all the signals. HD and PAL video ports are on BNC connectors. The other connectors are RJ45 / D SUB. On the rugged version 4 audio are dispatched on Neutrik XLR. Optical and remote power access is done through a Neutrik OpticalCon DUO or LEMO 3K socket. Each equipment has a LED display panel for signal presence and alarm display. 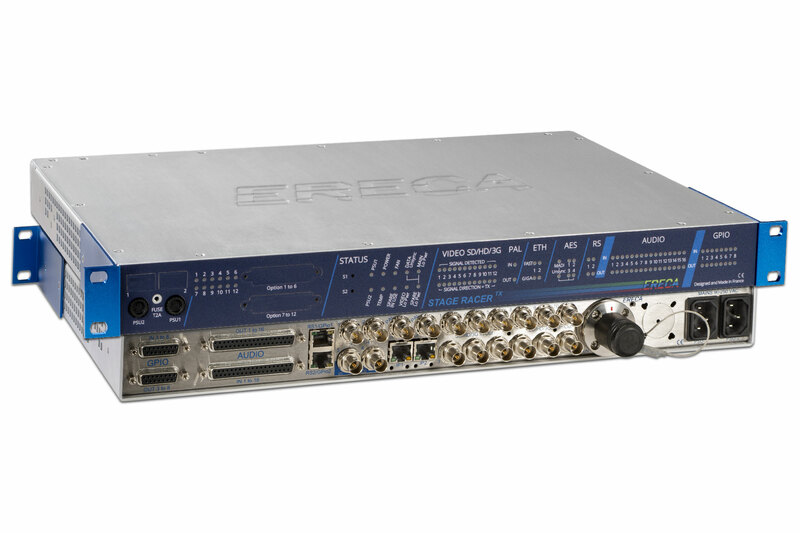 An internal web server enables remote management and setup (signal presence report / optical power measurement / Data settings / Configure direction of each HD video signal). Number, connector: 4 to 12 channel on BNC (Each signal direction configurable). Direction setting Internal Web Server. Number, connector: 4 bidirectional channels, 1 RJ 45 socket per channel (2 internal connectors for customer custom). Input: Floating on the D-SUB, Input pin grounding on RJ45. Hybrid cable source: From 24 to 48 volts on powered device input / allowing 500m of AWG16 cable. 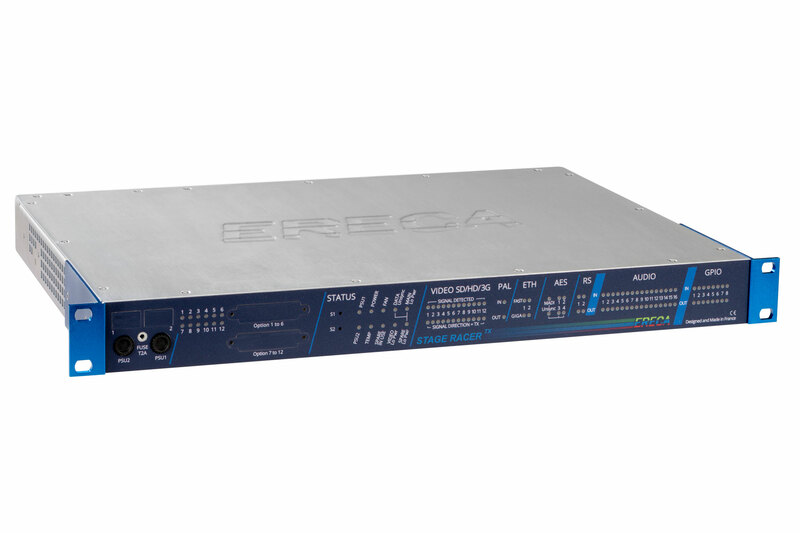 Rack model: 1 RU 19” rack, depth 300mm excluding connectors. Remote All signal presence / alarm are reported trough the web server. Settings All settings are done trough the web server.